A solo exhibition of paintings by Paul Mullins. In the words of the artist: "This work often draws from the patterns of behavior, increasingly capitalized on and exploited in advertising and marketing: the need to be tough, strong, a champion. The cult of the unassailable and untouchable individual in sports figures, action-movie mythology and the like continues to show astonishing influence on popular culture and is used to sell virtually everything." 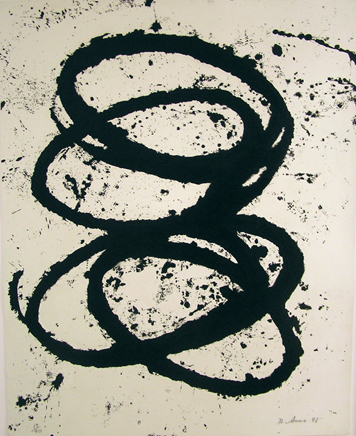 An exhibition of Serra's recent prints of rounds and torqued ellipses printed in collaboration with Gemini G.E.L.